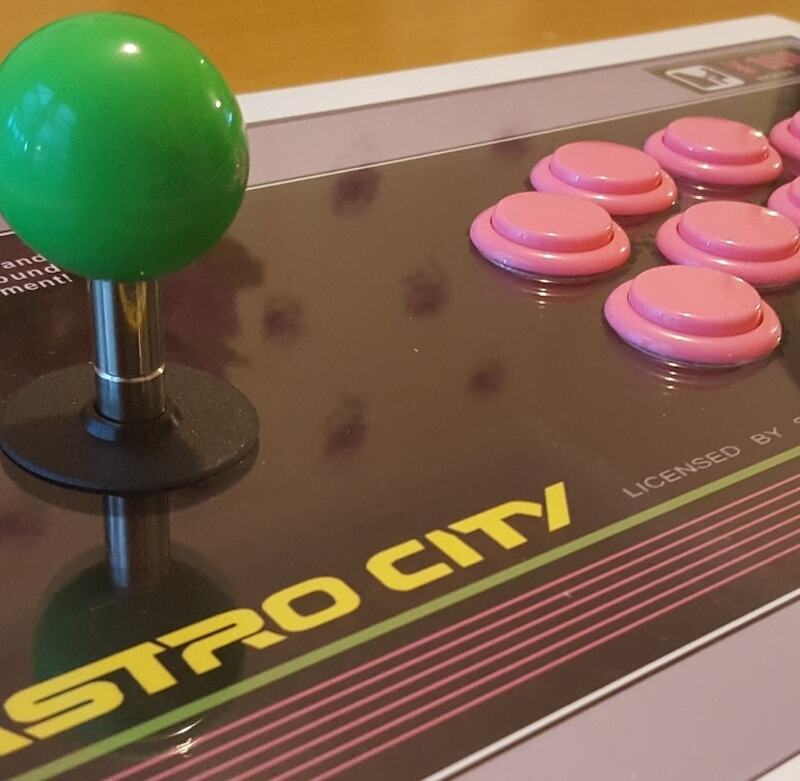 I picked up one of the New Astro City cabs that Olly (Alpha1) kindly shipped over en masse. 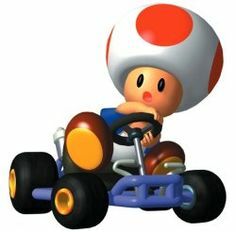 To be honest, as I was completely clueless about every aspect of owning a cab (apart from playing it! ), I was originally after a NAC where someone else had done all the hard work and all I had to do was plug it in and play it. They don't come up that often though and the price seems to be creeping up a touch, so I figured it would be a good way to learn more about maintainace and repairs as I went. After I'd put my name down for one of Olly's cabs I started doing some research about doing a restoration on one of these bad boys. There's a lot of useful info all over t'internet, but no one stop shop so I thought it would be helpful to gather all the information I'd found to help other people who were in the same boat as me. 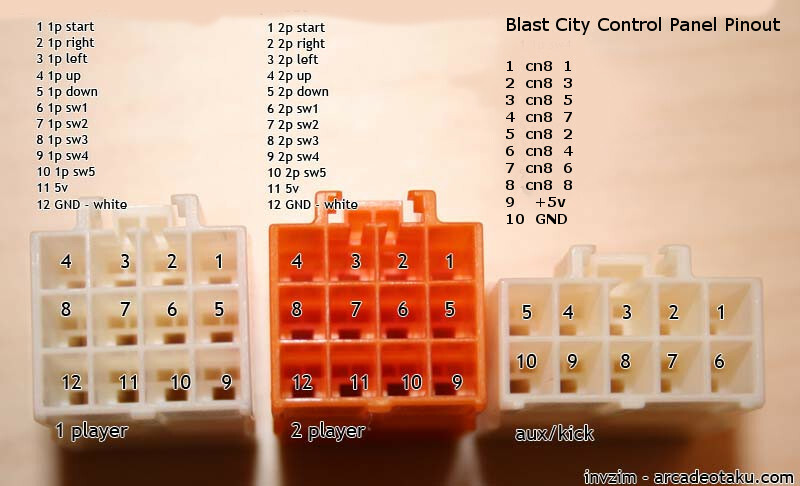 I know a lot of people will know all this already, but for noobs like me it's hopefully of some use. The first thing I quickly realised was that a NAC wouldn’t fit through the doors on my house, or most houses for that matter, by 4cm. Sadly, there’s no way to just remove the control panel section so the whole thing has to come to bits. I found this guide and video really helpful when it came to eventually doing it. A couple of things that really helped was getting a cheap security torx set for several of the screws and DEFINITELY a JIS screwdriver, for the screws that hold the two main half of the body together. Plenty of stories about having to drill out the screws after trying to use a phillips on them. After some recommendations by people here and other forums, I picked up these and they did the job admirably. 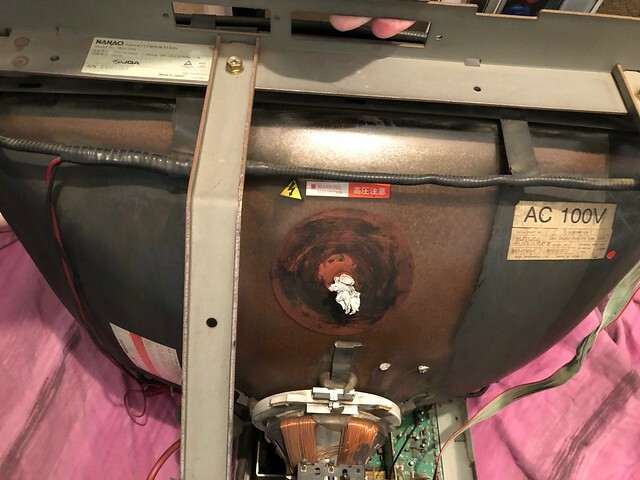 Next thing I noticed, when the cabs arrived in the country, was that the sides of the control panel section had cracks, but Olly kindly linked to a thread on Arcade Otaku about repairing them in the sale thread. I’d already decided that I wasn’t trying to get the cab looking brand new, just a bit more presentable and, in the case of the cracks, stop things getting any worse. Consequently, I wasn’t going to be going the whole hog (sanding, respray, etc) to make the crack invisible and just wanted to hold it together and reinforce it. So I went for this to do the repairs. 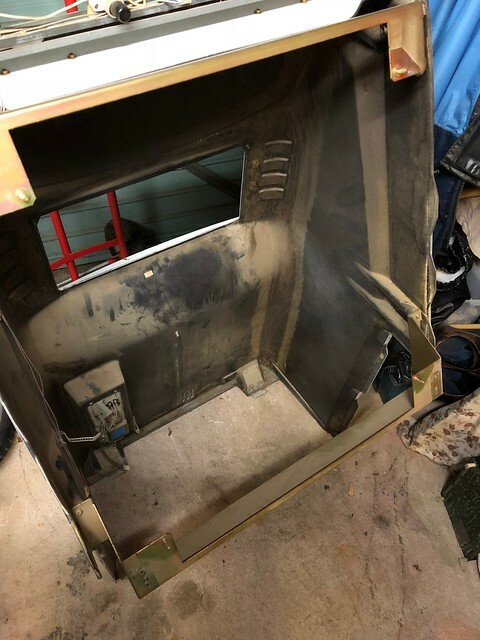 There was a few scuffs and marks on the cab that I initially planned to sort with some touch up car paint, but after seeing CraigG's cab that he also bought from Olly, I figured I get some gloss spray that would also do the speaker surround. It seems the best colour to match is RAL 9002 (grey/white). Probably the easiest thing to get in advance was the Sanwa joystick and buttons from Andy at Arcade World UK. 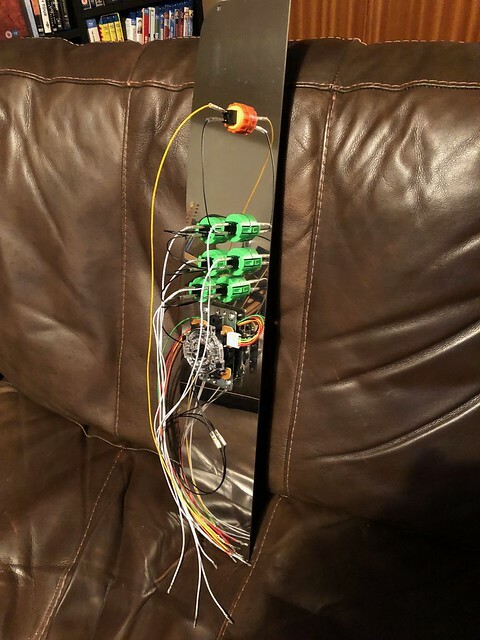 While I was at it, I also picked up some wires with 2.8mm crimps for the 1L6B control panel I planned on installing as the current one was past it’s best to say the least. 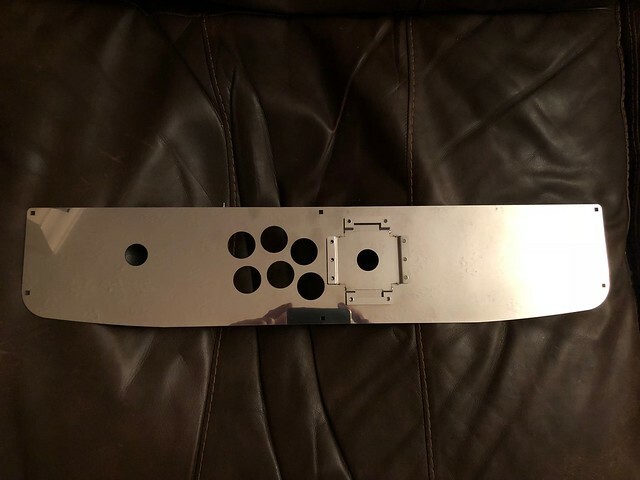 Was happy to get a repro panel, but a lot I looked at were a bit too glossy and most didn’t have the wholes pre-cut, so ended up buying one from Alberto1225 on Arcade Otaku (https://forum.arcadeotaku.com/viewtopic.php?f=35&t=37094) after hearing nothing but great things about his panels. Great guy to deal with and it arrived quickly from Hong Kong. Very impressed with the quality and was around £90 delivered. Not cheap, but you get what you pay for. It still has the protective film on in these photos. I think that's everything I did before the cab arrived, so will try and update tomorrow with what happened next. Nice! 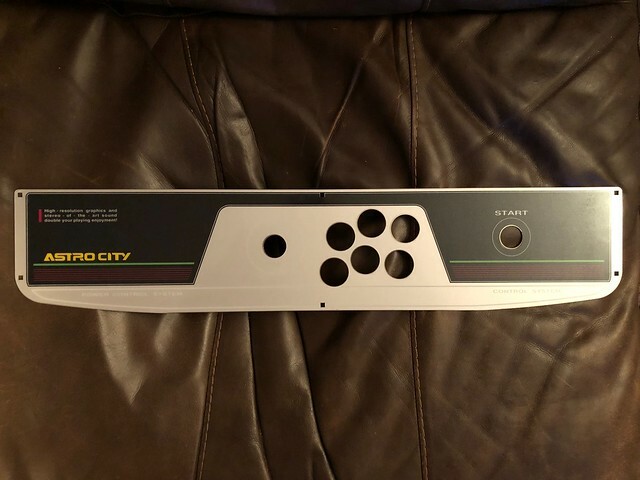 I've owned an Astro and New Astro in the past and they are probably the easiest cab to get parts for. 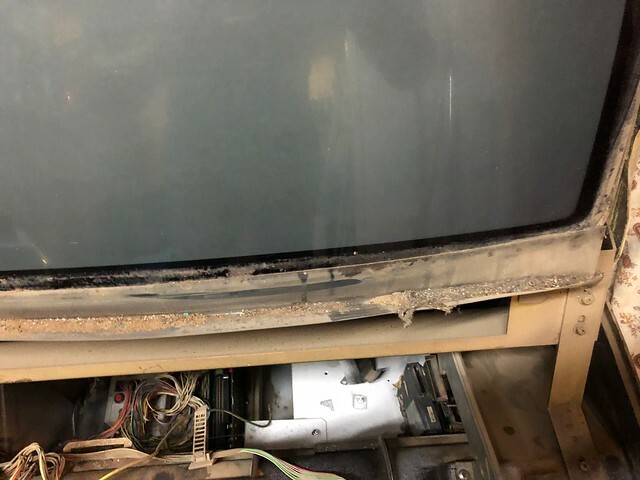 The only bummer is the fact you have to take the monitor/cp bezel off and the front part of the cab to get it in a normal front door! No such issues with my Egret II! Bet your really pleased with your cab now! Nice write up pal. 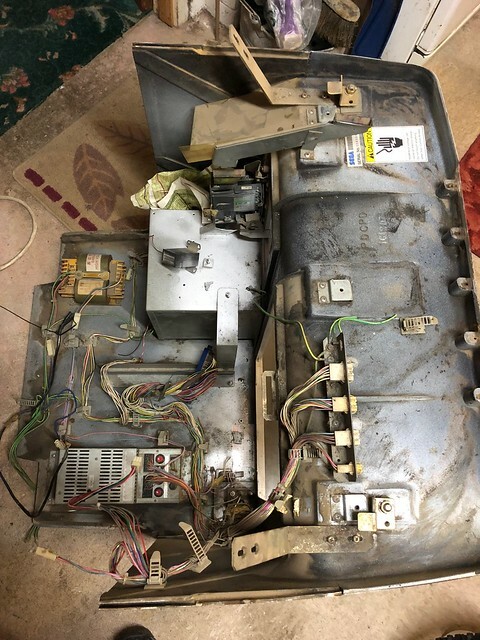 I know it was a touch overwhelming at first, but hopefully when you see each part of the resto, broken down into a manageable chunk, which you have then gone on to fix/remedy/restore, you will see that it can all be done. Giving you the confidence to crack on and do the rest. 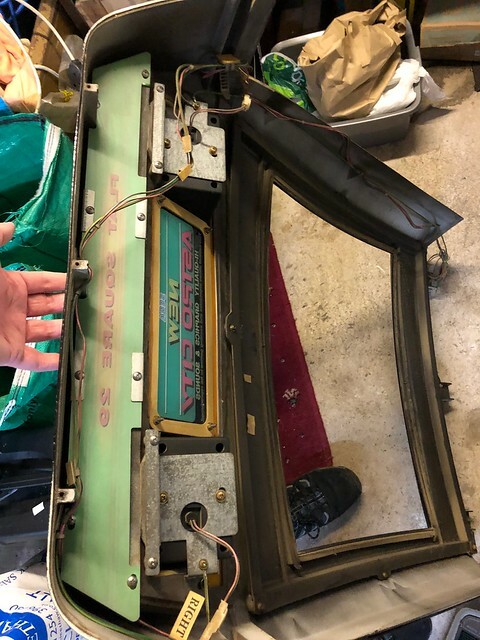 Looking forward to seeing the finished cab up and running and an invite to play. I'll bring pizza/beer - or is that not allowed near the shiny new minty cab!!!! Thanks guys, still a way off being finished and it’s all still in bits, but progressing nicely. Just need time! The whole house has bits everywhere and something new comes in the post every day. Today it was a nice set of locks, tangs and keys. Special thanks to neil1637 for all the help and advice so far. I’ve badgered him endlessness with wtf questions. Cheers pal, crimping lessons next! Will get some more updates put up as soon as I can. Great write up Nik I'm in the same boat so will read this thread with interest. Yeah nice write up :) A lot of info is out there, but good to get some it in the same place, especially as there are loads of new NAC owners looking to do this. I've had my nac apart 3 times in operate moves. damn those 4cm!!! Excellent service from Martin and my NAC was delivered bright and early one morning as promised. Sadly I don't have a garage to do the dismantling, so had to break the news to my parents that i'd be taking theirs over for a few days at least. Really busy at work, so had to work on it during the evenings. Not the best light and bloody freezing as well, literally. Anyway, first night and I set to work, following the guide and video I mentioned in the first post. Olly mentioned the cab needed a good clean and he wasn't wrong. This cab has obviously worked for a living for a good 20 years, but I like that. Gives it some character and I'd love to know the full history of where it's been and games it's had in it. 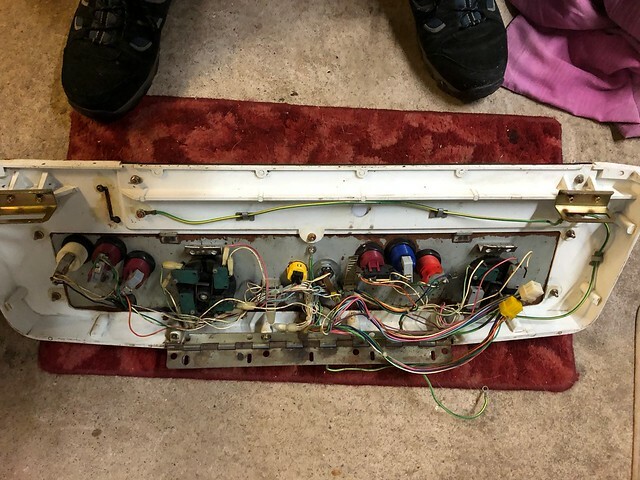 After checking everything worked, which it did, first thing I did was open the control panel and my hopes of an easy replacement were dashed as the wiring was soldered on to microswitches, rather than the easy to remove crimps. Not a big issue and I expected it, but a small challenge for me as I'm utterly useless when it comes to soldering and have pretty much zero ability with electronics. But that was part of this project, to learn that as I went. 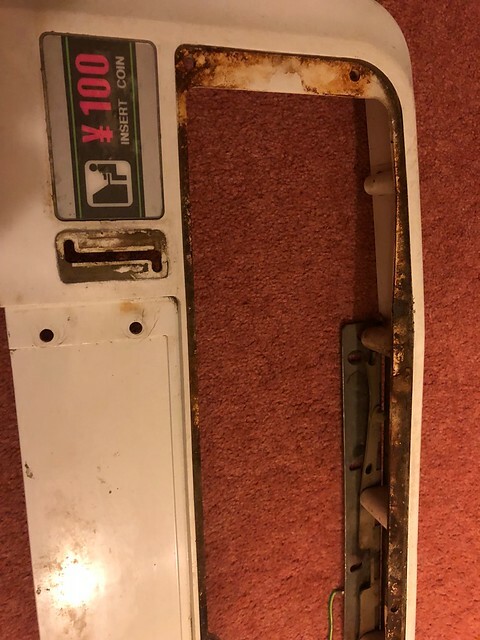 Quite a bit of corrosion on the metal parts, especially the back of the panel itself. Again, no problem as I already had the replacement. You can see the foam tape where the lid closes was all perished and was almost like slime when I rubbed it off. Again, 20 years of beer and fags spilled down the gap. Again, an easy replacement, but removing it did pull flakes of the paint off. More touching up to be done. So following the guide and video, taking it all to bits was actually really straight forward. There's only the three main parts and then the monitor, which I'll come on to later. As mentioned in the blog, it was the screws that hold the two main parts of the body together that are the only ones I struggled with, and I did struggle. The ones at the back were ok, but on the sides were a real struggle. It would have been a lot harder without the JIS screwdriver, but I still ended up having to drill two of them out. Because they're tucked up against the body, it's really hard to get any torque behind it, especially if you've got big hands like me. In the end, I took off an inch square layer of skin of my first knuckle as it kept catching. Naturally, this ended up getting infected (probably due to the 20 year old gunk and dust) and I had to go to the doctor for the first time in 10 years to get it sorted! Eventually though, and very satisfyingly (even a word? ), I had it all in bits. Here's a few photos if you've never inside one of these, and also to show how dirty it was. 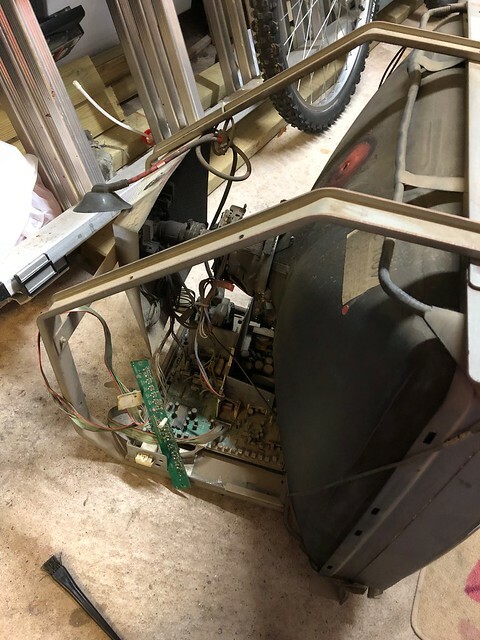 Everything was coated in a thick layer of dust and grime that no amount of compressed air was going to shift, but it easily came off with a good scrub and several refreshes of water. Interesting to see in the second to last photo that, for some reason, someone has done a bodge job of wiring in an old figure 8 power lead. Anyone have ideas why? Finally, a few pictures of the inside after an initial clean. Much better. After initially freaking out at all the wiring, coming back to it the next day I realised it's actually pretty simple and finally got my head round how a cab is wired up. Much easier to work out on a cab this size, especially when it's in bits. Plan B is working, I'm learning. Mines got the figure of eight cable wired in too! I can't see what it'll be for though..? 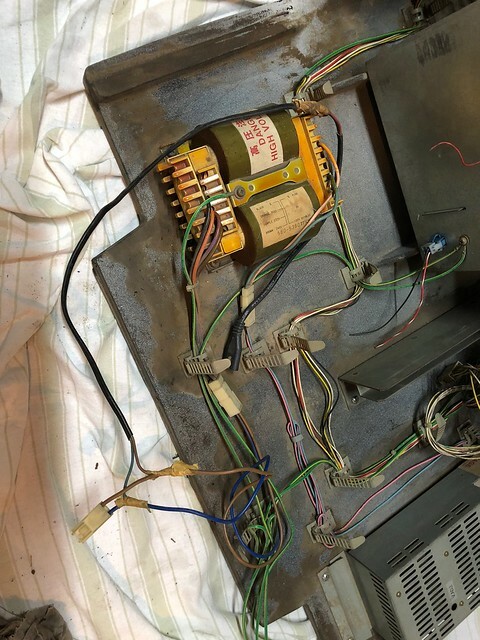 and the earth cables cut at the control panel, just like yours But yeah, the wiring is simple, it's just a jamma cabinet after all. I'm decent enough at DIY and will give most things a go, but there there are two things that scare me. One significantly more than the other. The not so bad one is mains plumbing, and that's mainly from my first adventure when I replaced a toilet. In short, there was some minor flooding and shorting of electrics in the kitchen below. This leads me on to the thing that scares the living crap out of me................ mains electricity!!! As I've said before, I have pretty much zero knowledge about electrics beyond wiring a plug. Even with my limited knowledge, just a quick look in the back of any cab will highlight the dangers of sticking your hands anywhere near that neck or board. As I now had my second cab, I figured I should learn how to do the mythical discharging of the monitor. This thread was a great help and I picked up a multimeter and high voltage probe from CPC. 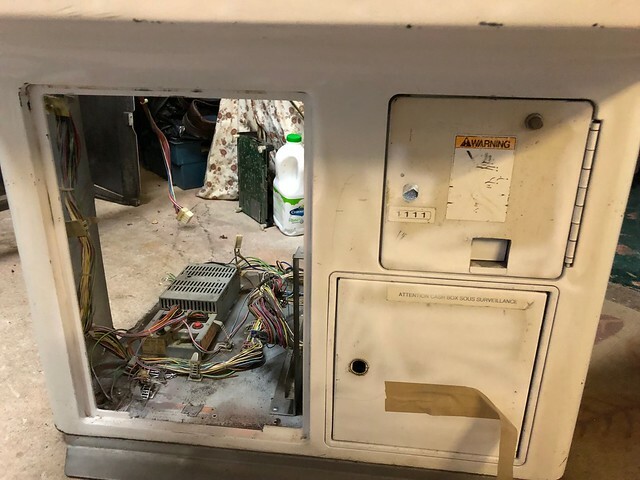 I figured I should discharge the monitor before removing it as I was finding it hard to disconnect the molex connector without my hand getting near some scary bits. 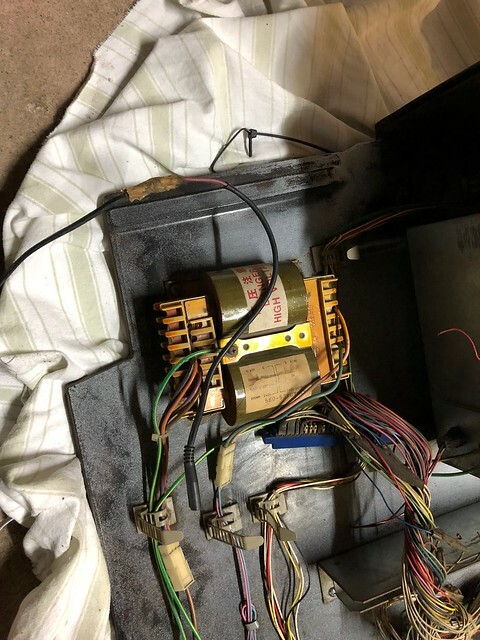 It was a bit of a faff doing it through the small panel at the back and it probably didn't help that I felt like I was diffusing a bomb, but it went without a hitch and the meter never read anything but zero. That said, I must have checked it twenty times before I dared put my hand in to remove the anode cap (more shaking and sweating). Being big lad comes in handy sometimes, so getting the monitor out was ok, but shifting it any distance was hard work. Unsurprisingly, it was a bit grubby and the little tray at the bottom had done it's job and caught a lot of crud. I did do another twenty checks with the meter before putting my hands in and around it to clean. The photos don't really show how grubby it was, especially the neck and back. Thick black soot type muck, but it came off with a soft brush and dry cloth. I was careful not to use any water as that can bring off the aqualag, which is something I'd never heard of before this. I didn't want to remove the whole chassis, so did the best I could with restricted access to some parts, but it's still a big improvement. God knows how this even worked before! Much to my dad's delight, I was now at a stage where I could move everything out of the garage and into my house. That was easier than I expected, with the exception of getting the monitor up a flight of stairs. No gym required that day. A couple more updates. 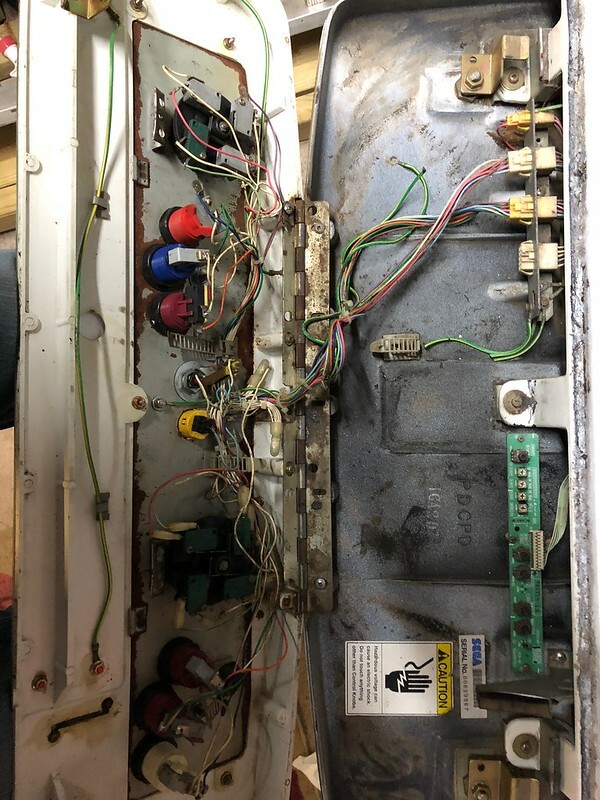 First was what I thought would be a simple job and getting the old control panel out to give it a good clean before putting the new one in. The CP is held in by 6 x M4 bolts and the first three came out no problem by simply loosening the nuts. What I've gathered dis that this cab has never been apart and the CP is original. Every screw/bolt felt like it was glued in and loosening each one was met with a satisfying crack when it broke the seal/bond. The problem on the CP is that the bolts were held in place by the square on the CP allowing you to loosen the nut, but mine was quite corroded so on there of them it just span as I hadn't broke the seal. Not a big problem in itself as you can just dremel a slot in the bolt to hold it in place. However, as with everything in these cabs, the parts seem very specific and pretty rare nowadays. A lot of places sell spare parts like these bolts, but none seemed to have them in stock. Thankfully, HK Legend came through and some new bolts came within the week. A great place for spares. Once I got them, I could happily dremel the old bolts out, leaving me with this. A lot of rust, left for a long time. Thanks to some advice from my old friend neil1637, I set about with some fine grain sandpaper and wet sanded it to this. There's still a lot of marks and discolouring, especially on the front part, so I'm not sure if I'll just polish it out as best I can or go for a respray. Either way, it's looking a lot better as it is now. The 100 Yen sticker isn't trashed, but tatty enough that I'll probably go for a repro from Olly (Muddymusic). The instruction panel card is actually in good shape, so need to replace that. Amazing really, given how much liquid seems to have been spilt on around the CP. The coin entry looked like something had been chewing on it, so I picked up a replacement from HK Legend when I got the bolts. They only had silver ones, but a quick respray will sort that. The hinge is also knackered on the half that connects to the main cab. Only the two middle screws are attached as the outer two are snapped off. Probably explains why the body is cracked as it looks like it's been twisted and a lot of weight put on it. The hinges are rarer than rocking horse poo, so it'll go on the back burner for now. Easily sorted down the line without having to take things to bits again. 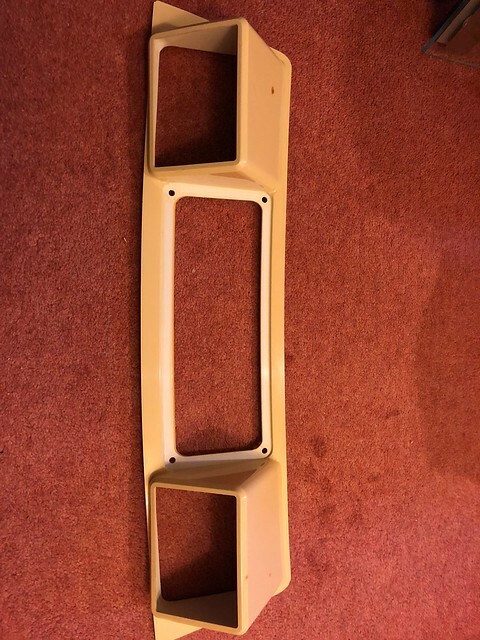 Another job that I thought was going to be really easy was removing the yellowed speaker surround to give it a respray. 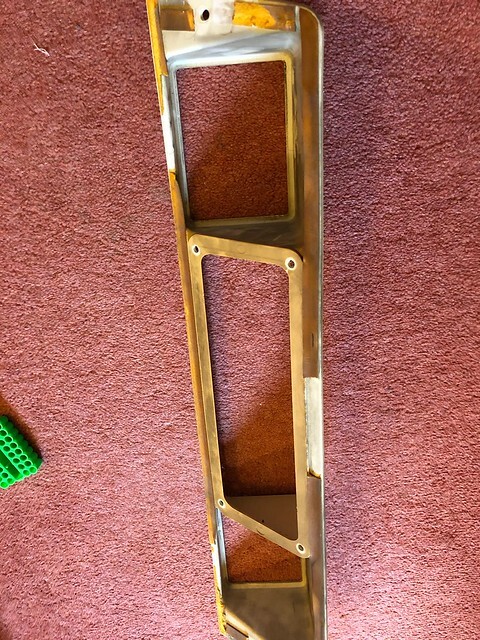 Apart from getting the screws out that separate the two main halves, this was definitely the biggest pain in the arse. 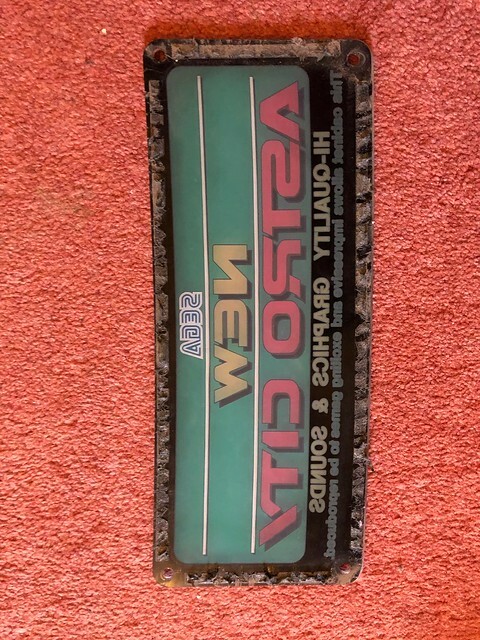 Both this and the small marquee are seemingly glued in with double sided songe tape. Given that they're 20yrs old, I didn't want to go riving and pulling in case it cracked the plastic. 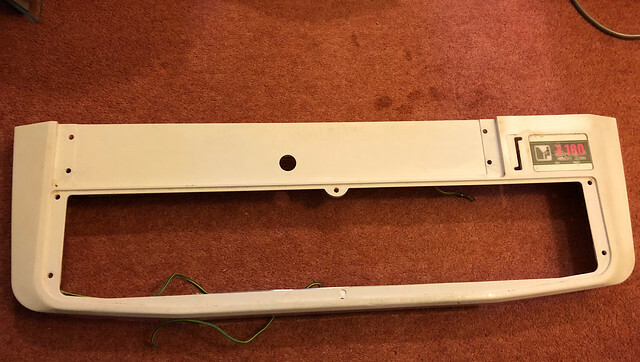 In the end, I went round with a thin screwdriver wrapped in a cloth and poked it through the gap between the surround and panel every few mm working my way round until it broke the seal. Hard work, but it eventually came free and looked like this. I followed the same process with the marquee and ended up with this. Weirdly, I found the easiest way to get rid of all the adhesive on both was to use my thumb and rub it off by pushing from the edge, all the way along. I ended up with a nasty blister, but it worked way better than anything else. A quick clean and rub down with 99% alcohol and ready for painting. One thing to be aware of when removing the marquee part is that it's very easy to scratch off the paint on the inside of the marquee, so it's really obvious when the light shines through it. Luckily I only scratched off the black paint, so easily fixed. More luck than skill though, so be aware. 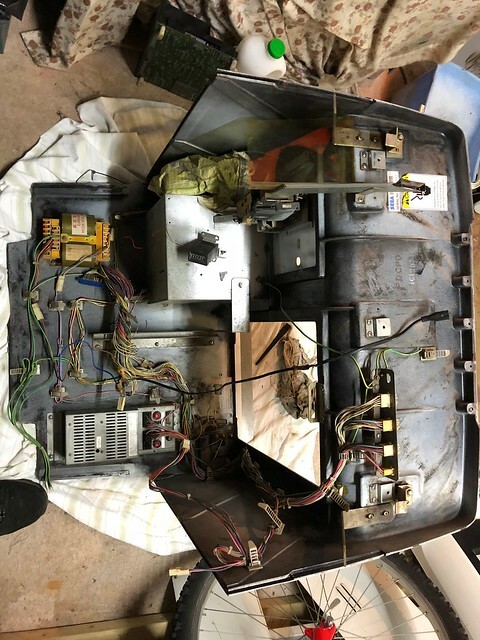 So, some good progress and just the whole outside of the cab to clean and touch up, respraying of the surround and maybe the CP and rewiring the new control panel, which I have zero experience of. Luckily I ordered plenty of connectors so plenty of crimping practice in store. I did buy a new Jamma harness, but not sure if I'm going to fit that or stick with the one that's in and works. 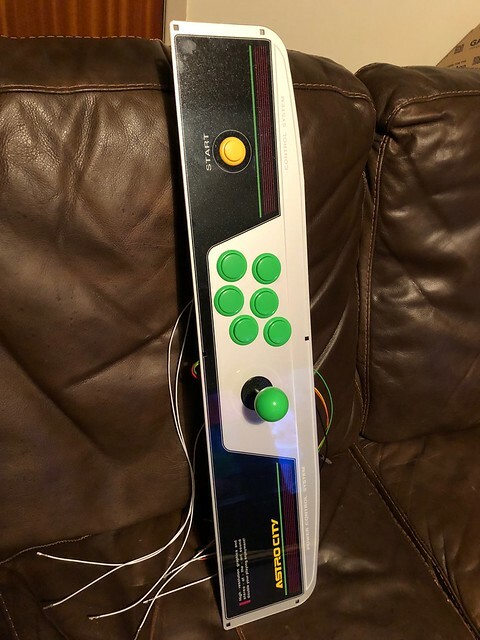 I would leave it, but fancy having a 6 button setup for the fighters, so figure I may as well do it while everything apart as it's not something that can be done when it's one piece. So first hitch today. I picked up some ral 9002 gloss spray paint to repain the speaker surround and maybe touch up the worst of the marks. What I’ve always thought odd is that every part of a NAC looks clean white to me and not grey white, but everything I’ve read says grey white 9002 is the best match. Yesterday I did some testing on inconspicuous areas and it doesn’t match. Don’t get me wrong, it’s not miles off, but just a tiny touch darker. This just reinforces my thought that it is white. 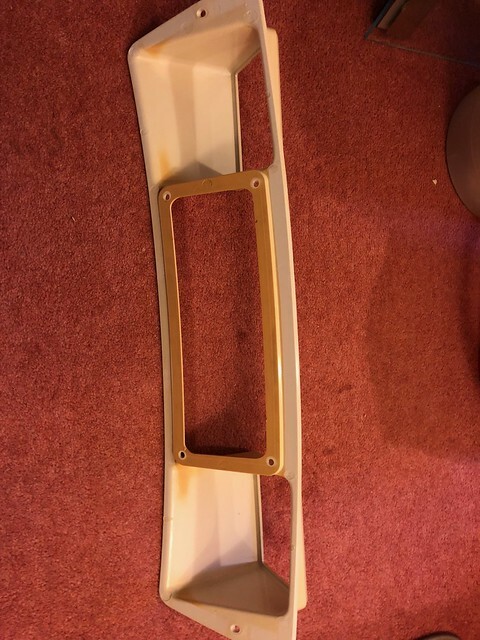 Anyone else found this or used any other colour, most likely white, to spray the speaker surround? This guy used "Rustoleum All-Surface White" for his speaker surround. 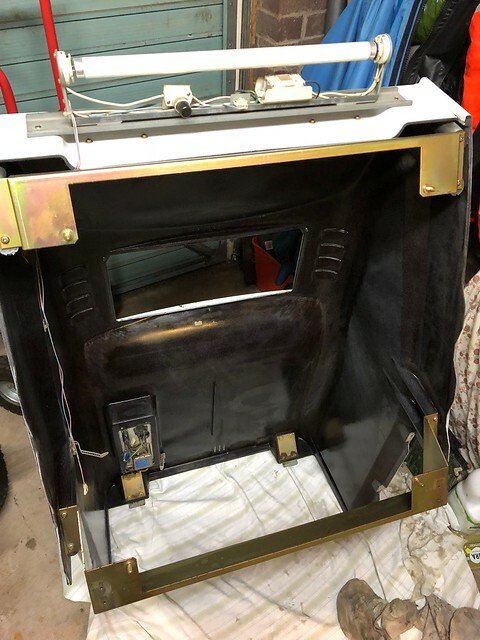 This guy had his whole cab sprayed in "Appliance White"
You could always use Retr0bright on the speaker surround but that won't help for the rest of the parts that needs touching up although a member on Arcade Otaku uses Audi's - "Candy White"
so it may be worth looking into that. Edit: There are a few posts of people using "VW paint" to touch up. It appears that the "Candy White" paint is used for Audi, VW, Seat and Skoda and it's code is LB9A. Thanks pal, that's really helpful. Just wish I'd only bought one can of the grey white, instead of jumping in feet first. I'll maybe try and flog them, 2 x cans going cheap, one only a teeny bit used! Still a productive day though as I finally got round to wiring up the control panel from scratch, which involved some crimping on the end that goes into the molex connector. I found this page very useful in getting my head round the AMP Universal connector. Handy image showing what hole is for what. It's for a Blast City, but think the NAC is the same. There are the parts I ordered from RS, male connector but female pins. I appreciate this isn't the most taxing of tasks in the hobby, but never done it before, so feeling quite pleased with myself. Until none of it woks and I have to rip them all out! I wouldn’t go for pure / appliance white. Just hold a sheet of paper up against the cab to see what it might look like. It may have been me that suggested 9002 on AO. Sorry it’s not worked out, but I thought it looked good! Here’s a pic of my NAC, a piece painted in 9002, and finally a piece of white paper. I’d certainly be interested if someone can find a better colour code. Hi Zipper, don't worry about it, there was a lot of posts I read that said 9002 was the best colour. Your post actually got me thinking. I think a lot has to do with lighting and how things change in a different light. When I looked this morning the room was really bright with the sun and every part of the cab looked bright white, but just had another look tonight after seeing your photos and it has that greyer look. Weirdly the bits I did the test spray on are a better match, like in your photos. I get the cab looking different in different light, but the parts I sprayed look the same. Maybe the finish on it? Anyway, since I've got it, I'll probably do the speaker surround and see how that looks before going any further. Nothing ventured, nothing gained. Cheers.